Hello, I know you probably think I fell off the earth....LOL. I promise I haven't, we just had a big event in our life. We sold our home and bought a new one. It actually consumed my whole summer, as I was getting it ready for sale and than after bidding on two homes I didn't fully love and didn't get we found a home we love and moved on October 1st. So, hence the reason for not posting in a long time. But I am back and I have a few cards to share with you this week using JustRite Papercrafts October release stamps, which I was dying to use, so I finally had a chance to play with them at a crop I went with my friends. I also got a new photo box and I have to learn how to use it better, so be patient with me. Right now I am still getting too much grey in the background. If you have a tip on how to eliminate that, I welcome it. I use Photoshop for editing, but somehow still getting the grey. 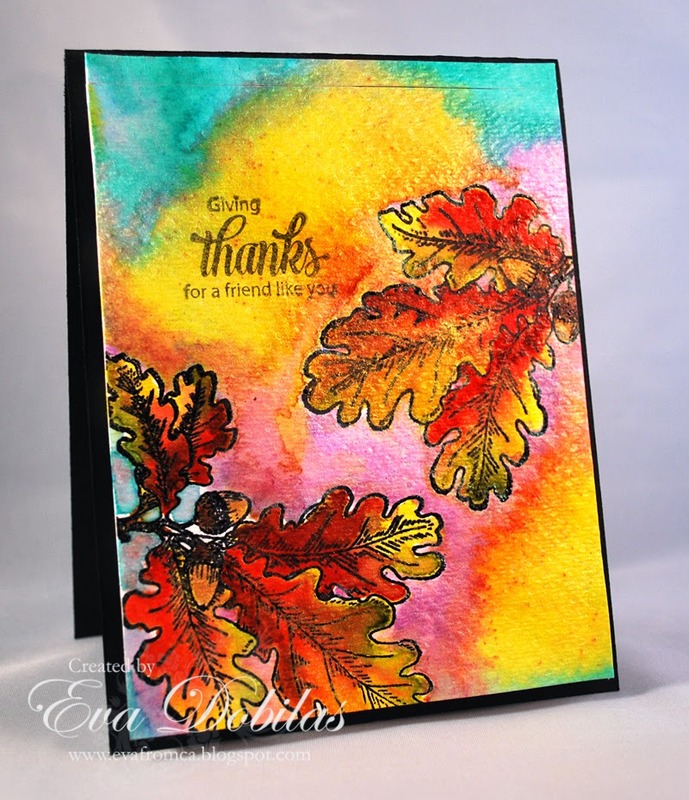 Anyway, let me start off with the first card of the week, which was created with the gorgeous Oak Leaves. I knew I wanted to use watercoloring on this card as it was just screaming for it. And one thing I haven't pulled out in a while is my Twinkling H2O's, so I decided to paint my card with that. I embossed my images onto a watercolor paper using black embossing powder. I find it's better to do that with watercoloring, if I want to contain the colors within the lines, so I did that. I love the effect of it and hope you do, too. I didn't add any ribbons, or bling or anything to this card as I felt it just didn't need it. Hope you like it. I think it encompasses the feeling of fall pretty good. By the way, I don't know if you know this, by JustRite Papercrafts has the new Spellbinders dies available. I just ordered a few new dies I had to have and thought I would let you know. Also there is a great sale on the older Spellbinder dies, and they are not really that old, trust me, so it's perfect time to stock up on them! Well, that is it from me today. I'll be back with more later. Have a fabulous day!